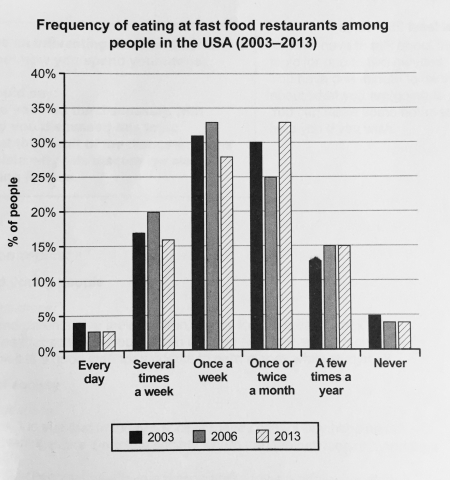 The chart below shows how frequently people in the USA ate in fast food restaurants between 2003 and 2013. The bar chart illustrates the frequency with which Americans ate in fast food establishments from 2003 to 2013. It is clear that the majority of Americans ate in fast food restaurants between once a week and once a month in all three years. We can also see a shift towards eating in these restaurants less frequently by the end of the 10-year period. In each of the years shown on the chart, close to 60% of people in the US ate in fast food restaurants between once and four times a month. Roughly 15 to 20% of Americans reported eating in fast food outlets several times per week, while 3 to 4% of people ate in these outlets daily. At the other end of the scale, around 4% of people avoided fast food restaurants completely. Between 2006 and 2013, the total proportion of Americans who ate in fast food establishments either once a week or several times a week fell by almost 10%. At the same time, this translation is from laokaoya website, there was an increase of around 8% in the ‘once or twice a month’ category. In other words, the weekly fast food habit that was common in 2003 and 2006 became a monthly or twice monthly habit in 2013.